I have a really quick post today; I am sharing 4 cards using the Stampin’ Up Marquee Messages stamp set. We are winding down the 2017-2018 catalog and over the next couple of weeks you will see a lot of these “quick posts” to share some older samples with retiring stamp sets! I want to make sure if you like these stamp sets, that you get a chance to order them before they are gone forever! 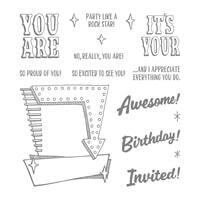 The Marquee Messages Stampin Up set is a lot of fun and perfect for young and old….male and female. Remember, it’s retiring the end of the month, so, if you like it, make sure to grab it soon before it’s gone forever! Some of the colors, cardstocks and papers on these cards are already retired from a couple of years ago. But these card ideas could easily be made using any colors!!! Get the Marquee Messages Stamp Set Today–before it’s gone forever! If you like this stamp set, just click the picture below to go to the store and order it. The brand new 2018-2019 Annual Stampin’ Up! catalog will be coming soon!!! Customers who have placed at least a $50 order through me since June 2017 will automatically receive a catalog. You do not need to request it! You should receive your free catalog around the middle of May; it’s my gift to you for being a valued VIP STAMPER!